Playing chess on the plateau near the Chess Street in the town of Ravna Gora in Croatia. Playing Zdenko Jurković on the left, president of the Chess Club Goranka, and Stjepan Šturlan, president of the Croatian Chess Union, judge Mladen Bratošević, international chess judge from the city of Split. It is good that it [i.e. the Chess Street] exists, but it is a pity not to be in Russia. Aleksandar Lysenko, a Russian international chess master, is the author of an article "In the Chess Street" (V sahmatnoj ulice) published in the well known Russian chess journal "64 Chess Survey" (Shahmatnoe obozrenie), no 9, Moscow 1996, p 39. 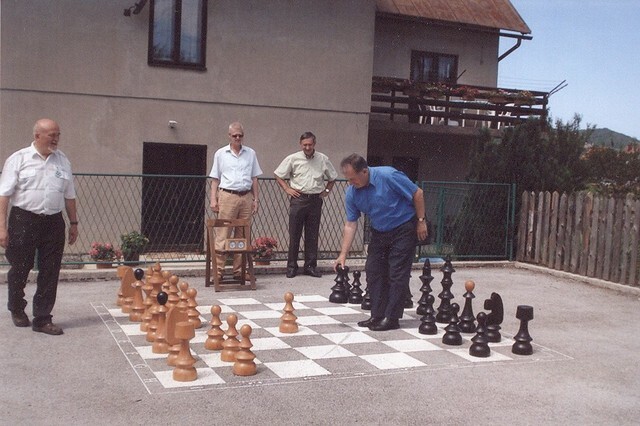 The article deals with the Chess Street in the town of Ravna Gora in Croatia. "It is good that such a street exists", he wrote, "but it is a pity that the street is not in Russia" (Horosho, chto ona est; zhal' chto ne u nas). In Sahovska ulica no. 6 (Chess Street no 6) in the town of Ravna Gora, there is a local chess club. Mr Lysenko wrote that he does not know of any other street in the world with such a name, not even in his native Russia, one of the leading chess powers in the world. The idea for naming the street came 1991, during dramatic days for Croatia. The decision for the Chess Street was taken unanimously. And the initiative came from Professor Zdenko Jurković, a well known Croatian popularizer of chess, especially among the young. 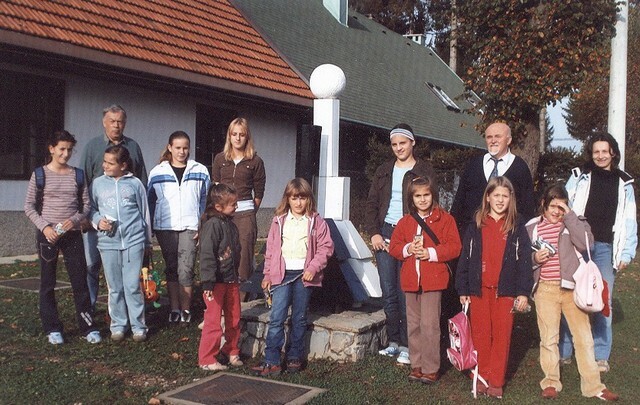 The Chess Club "Goranka" was founded in 1981 upon the initative of Mr. Jurković, and since 1991 its address is in the Chess Street in the town of Ravna Gora. It is competing within the First Chess League in Croatia. Mr. Alexandar Lysenko tried to describe in his 1996 article Croatian chess clubs, asking "What is their quality?" And continued as follows: "As an answer can serve a result of the match between the third best Croatian team "Slavonska banka" from the town of Đakovo and Kadyr, one among stronger Russian teams, within the Cup of European Champions the last year . The result was 3:3, but "Slavonska banka" entered the next round due to better overall results." The Chess Club Goranka in the Chess Street in Ravna Gora has a nice logo: a bear bearing the pion. Ravna Gora is a lovely Croatian town in the mounatinous region of Gorski Kotar on the north of the coastal city of Rijeka. 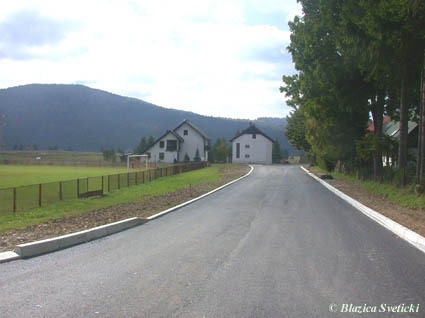 Bears living in Gorski Kotar are well known animals there. Many thanks to Professor Zdenko Jurković for submitting the story and to his wife Mira Jurković for the photos. XIIth Female Chess Tournament on the occasion of the Day of St Teresa of Avila, protector of chess. Some of the articipants gathered near the chess sculpture in front of the Chess Club Goranka in the Chess Street, the only one in the world. Simultaneous chess game by Yudai Iwasaki, Japan, with attendants of the Chess School at the XXIst Winter Chess School in 2007. 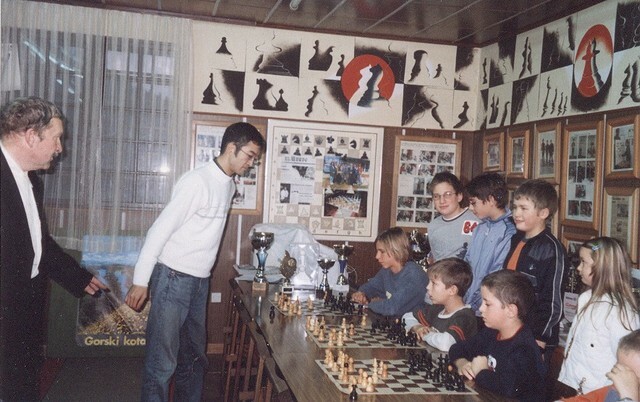 On the left is Alexandar Lysenko, a Russian trainer, in the hall of the Chess Club Goranka.